Enter a deeper meditation with help from subliminal messages which penetrate into your subconscious mind! Play this album while you meditate and you will enter a deeper state of meditation. It will focus your mind and clear your thoughts and help you to relax, calm down, and meditate like never before. Do you get bored easily when meditating and so struggle to deeply meditate for longer periods? If you start your meditation with good intentions but run into the problems above then this album will help you. It will send subliminal messages into your mind to counter these setbacks and to strengthen and focus your mind on your meditation session. It is a fast working album which you will receive benefit from in the first session. You will feel your body relaxing and your mind slowing down and the album will actively help you to enter a deeper state of meditation – naturally. With continued use you will see a lasting benefit from the album and you will be able to meditate to this deeper level quicker and easier, and even meditate without the album. Find meditation comes naturally and you are able to keep your mind and body totally relaxed as you practice. You will no longer struggle to meditate because you will be able to maintain control of your thoughts. This allows you to really focus and achieve deeper and deeper levels of meditation over time. Quickly enter into a naturally deeper state of meditation. Your thoughts will slow down and your concentration will be enhanced while meditating, allowing your mind and body to become refreshed. You are able to enjoy all the benefits you gain from meditation like, less stress, self confidence, better mental focus and increased creativity. Find that your mind will be so much clearer. You will be able to visualize your intentions in a lot more detail and this will have a bigger impact on your mind and body. Your entire body will feel revitalized. You will be able to go about your day feeling calm, relaxed and in total control of yourself. Experience your stress melting away. This album will also give you some natural stress relief - as you meditate deeper and deeper you will find your daily stresses and worries melting away and the tensions of your mind relaxing. Look forward to your meditation sessions! Meditation will no longer feel like a chore, you will not want to cheat and finish your practice early. You will find yourself enjoying your meditation sessions more and more and you will get more and more benefit from them! 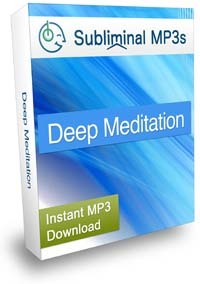 Use our powerful meditation mp3s today and experience a deeper state of mediation for yourself!